Dr. Julia is a Body Detective Chiropractor. She uses a strategic analysis method to determine the underlying causes of your pain. Just like a leaky roof often drips in an area distant from the actual source of the leak, the reason for the pain can be coming from a completely different place than the painful or even injured area. It is obvious from all the “Pain Clinics” out there that PAIN can be quite complicated. Often people with pain don’t have a clue as to what really caused it. A good electrical technician uses a meter to check for the source(s) of trouble in electrical circuits. Luckily, the human body is electrical in nature, and Dr. Julia knows how to check for the underlying causes of pain with her body detective analysis. The human body is a living matrix of cells. We start out as one cell – that divides and multiplies to form everything in our body. When you look in a microscope you can see there is actually a geometric shape to our muscles, bones, ligaments, cartilage, tendons, organs and other tissues. (1) This shape allows our tissues to be flexible, but when the shape is compressed due to injury – flexibility is lost. 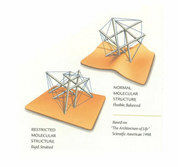 This biomechanical system is called tensegrity; the shape of the picture on the left. The living tensegrity matrix in our body resembles a sheet of fabric like a one piece spandex jumpsuit. When we hurt ourselves the resilient geometric matrix gets distorted like this picture shows. Injury can create tension patterns or puckers in the fabric. This distortion is causing pain and restricts flexibility. For example: A pucker in a hip can cause pain in a shoulder, knee, or anywhere in the body without causing pain or symptoms in the injured hip. This pucker creates abnormal tension patterns which affect other areas. Dr. Julia knows how to identify and correct abnormal tension patterns in the biomechanical tensegrity matrix causing stiffness, inflexibility and pain. Familiar with her healing methods, I was confident in her abilities and the range of treatments she offered. One of the many things I appreciate about Dr. Julia is that she gets to the root cause. She doesn’t treat the symptom, but looks for the cause. Traditional doctors are quick to prescribe pain relievers or other drugs. At Wellness Solutions, Dr. Julia Lewis addresses the problem without masking it. She’s an amazing doctor; I truly think she’s a miracle worker. When Dr. Julia works with you, she’s not distracted – 100% focused on you and your health. I’ve come to rely on Dr. Julia to maintain my health; she’s just amazing!